Download "Microfinance and Mobile Banking: The Story So Far"
2 2 Figure 1: Typology of MFIs in m-banking CONTEXT: MFIs in countries with no existing mobile banking infrastructure MFIs in countries with existing mobile banking infrastructure ROLE OF MFI: Build mobile banking system Use phones for data collection and other noncash purposes Use m-banking system for loan disbursements/ repayments and/or deposits Act as agent on behalf of bank or MNO In a country without an existing m-banking infrastructure, an MFI must decide whether to develop its own service or wait until the service and infrastructure are created. Developing an m-banking service takes a significant amount of planning, time, financial investment, organizational and operational change, technical expertise, and persistence and is an option only for MFIs with significant resources and a stable infrastructure. Other MFIs in this context can still use mobile phones to reduce costs and enhance customer service, for example, by sending automatic SMS messages for repayment reminders and allowing customers to check balances via their phones. The first section of this paper explores how MFIs in this context are responding. The second section looks at the options available to an MFI if it is in a country with an existing m-banking infrastructure. The most obvious option is to use the m-banking network for loan disbursements, repayments, and deposits. As an alternative, MFIs can act as agents on behalf of the m-banking service. This may allow the MFI s management, staff, and customers to gain familiarity with the service and earn additional revenue for the MFI through commissions. 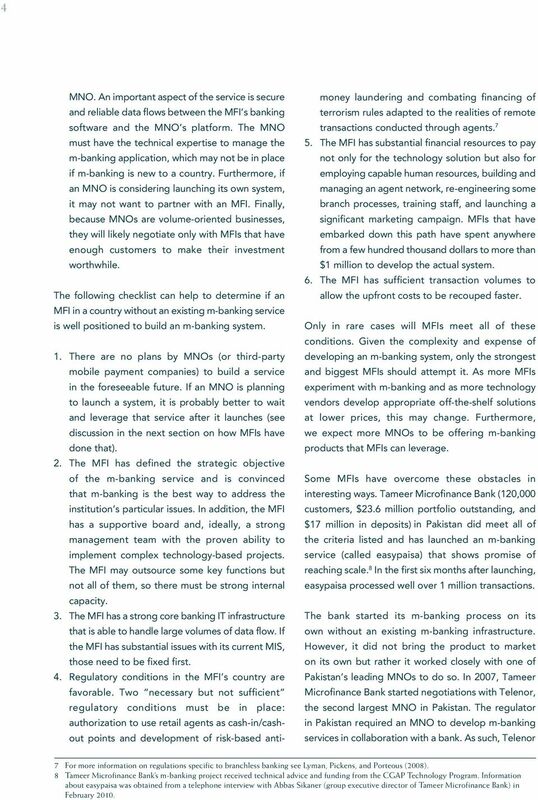 The third section of this paper addresses questions that MFIs may have about m-banking. While many see the potential of m-banking, what are the actual benefits for an MFI and its customers? This section explores three key questions: 1. Can m-banking help MFIs serve existing customers better? 2. Can m-banking help MFIs reach new customer segments? 3. 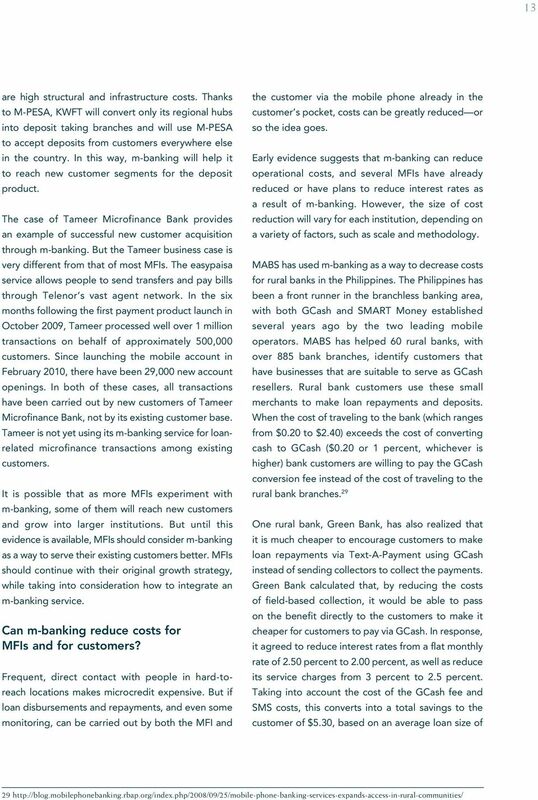 Can m-banking reduce costs for MFIs and for customers? Should an MFI in a country without any existing m-banking infrastructure create its own m-banking system? Let s return to the story of Opportunity Bank of Malawi and its decision to develop an m-banking service in the absence of an existing m-banking infrastructure in the country. How did this small microfinance bank fare in the midst of the various challenges involved in setting up an m-banking service? Unfortunately, as Opportunity Bank discovered, setting up an m-banking service is complex, timeconsuming, and expensive. Most m-banking services used by commercial banks focus on existing (often upscale) customers who want more convenience, as opposed to bringing the unbanked into the financial system. 4 Developing an m-banking service from 4 Offering a cell phone banking channel is becoming common for many banks in Africa and elsewhere in the developing world. For example, all four of South Africa s major banks and 13 of the largest banks in Kenya now advertise cell phone banking. Similar to Internet banking in developed markets, this channel lets existing customers conveniently access their accounts at any time. However, the typical cell phone banking offering is often limited to basic informational services like balance enquiry, airtime top-up, and mini account statements. 3 3 Box 1. Main Messages Developing an m-banking system is expensive, time consuming, and complex; very few MFIs have the significant financial, technical, and managerial capacity that is required. Most MFIs should use mobile phones in ways that increase customer convenience (e.g., automatic loan reminders) and strengthen the institution so that it will be ready to link to a system when it is developed. scratch that effectively reaches the unbanked is not easy. In the first months of 2008, Opportunity Bank discovered many regulatory, technological, and operational hurdles. It hired external consultants to help develop an appropriate plan that focused on the following four activities that are required for any MFI developing an m-banking service. 1. Develop a strategy and business plan. 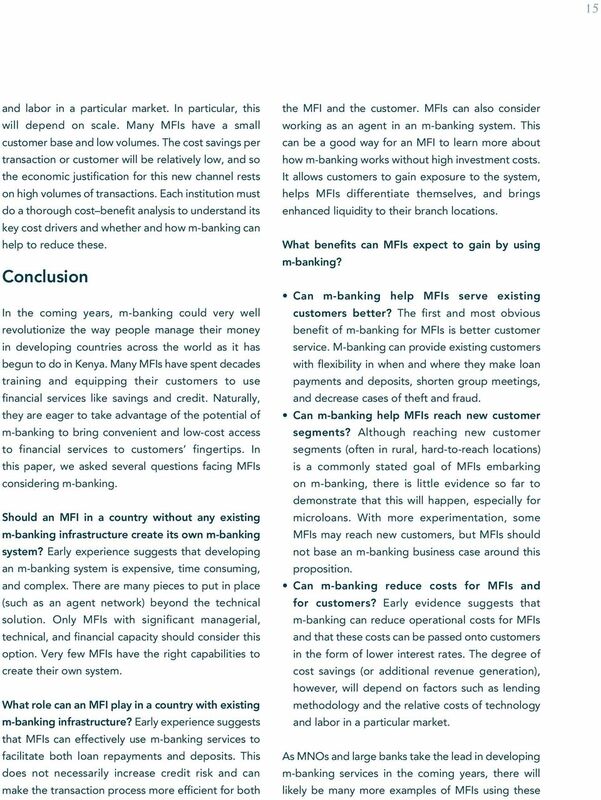 MFIs must be clear about how m-banking addresses their core customer value proposition. In an industry with as much hype as m-banking, it is easy to get carried away with enthusiasm without fully understanding the benefits and costs. MFIs must identify the problem they are trying to solve and determine how exactly m-banking will solve that problem. Are there alternative solutions available? For example, is the primary purpose of the service to improve satisfaction and retain existing customers? To reach new customer segments or new geographic areas? To reduce congestion in branches? To reduce transaction costs (which ones)? Are ATMs, kiosks, or mobile banks a better solution? MFIs should be as specific as possible about what they want to achieve before committing to developing a system. 2. Develop a technological solution. Developing a technological solution is time consuming and expensive. First, the bank s own banking software must have the ability to be integrated with an m-banking platform. Opportunity Bank had to do an entire systems upgrade a process that took a year and cost more than $100,000 to complete. 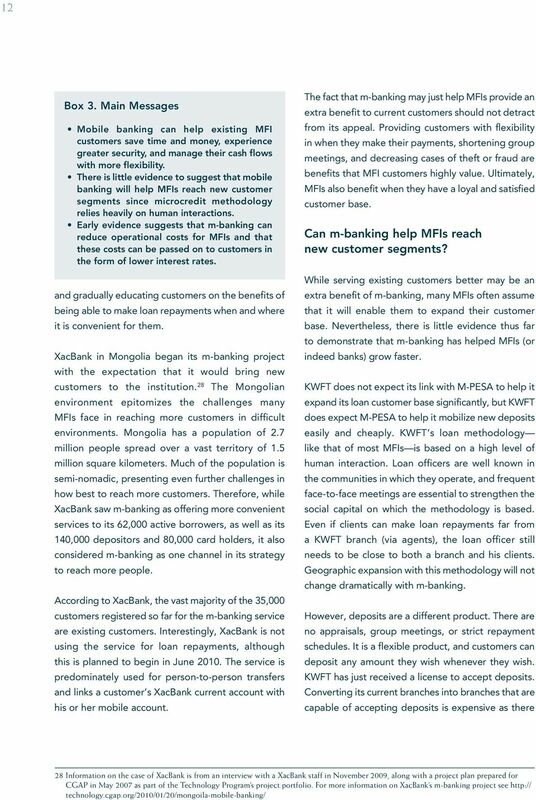 XacBank, a microfinance bank in Mongolia, invested even more than this to upgrade its core banking system before developing its own m-banking service. 5 Second, the phone s interface with the bank (e.g., SMS, USSD, STK, etc.) must be selected. Important factors influencing this decision include security, ease of use, ability to function on unsophisticated handsets, and capabilities of the MNO. 6 Opportunity Bank developed a USSD interface that it felt was secure and would work on even the cheapest phones. Finally, the interface or middleware between the management information system (MIS) and the customer-facing application must be developed. Institutions can purchase an off-the-shelf solution or develop their own, although both options are expensive. 3. Create and manage an agent network. To use an electronic channel, such as mobile phones, for financial services, customers have to convert cash to electronic value and vice versa. This can be achieved through networks of retail agents, such as airtime resellers, post offices, and small store owners. MNOs have a distinct advantage in this area because their national-scale networks for airtime distribution often involve distributors and thousands of retailers. Building and managing an extensive agent network from scratch is considerably different than running an MFI. The business processes involved include identifying and training agents and ensuring an effective, continuous system of liquidity management and quality control. In light of this, Opportunity Bank decided to partner with a major agricultural supply store in Malawi that had shops in many Malawi towns. Doing so leveraged the nationalscale infrastructure of the agricultural supplier and eliminated the need to manage individual stores. 4. Negotiate partnerships with one or more MNOs. An MFI or bank cannot develop an m-banking service without the cooperation of at least one 5 XacBank s m-banking project received technical advice and funding from the CGAP Technology Program. 6 For a more detailed explanation of the types of technical choices defining the mobile banking platform, see Mas and Kumar (2008). 4 4 MNO. An important aspect of the service is secure and reliable data flows between the MFI s banking software and the MNO s platform. The MNO must have the technical expertise to manage the m-banking application, which may not be in place if m-banking is new to a country. Furthermore, if an MNO is considering launching its own system, it may not want to partner with an MFI. Finally, because MNOs are volume-oriented businesses, they will likely negotiate only with MFIs that have enough customers to make their investment worthwhile. The following checklist can help to determine if an MFI in a country without an existing m-banking service is well positioned to build an m-banking system. 1. There are no plans by MNOs (or third-party mobile payment companies) to build a service in the foreseeable future. If an MNO is planning to launch a system, it is probably better to wait and leverage that service after it launches (see discussion in the next section on how MFIs have done that). 2. The MFI has defined the strategic objective of the m-banking service and is convinced that m-banking is the best way to address the institution s particular issues. In addition, the MFI has a supportive board and, ideally, a strong management team with the proven ability to implement complex technology-based projects. The MFI may outsource some key functions but not all of them, so there must be strong internal capacity. 3. The MFI has a strong core banking IT infrastructure that is able to handle large volumes of data flow. If the MFI has substantial issues with its current MIS, those need to be fixed first. 4. Regulatory conditions in the MFI s country are favorable. Two necessary but not sufficient regulatory conditions must be in place: authorization to use retail agents as cash-in/cashout points and development of risk-based antimoney laundering and combating financing of terrorism rules adapted to the realities of remote transactions conducted through agents The MFI has substantial financial resources to pay not only for the technology solution but also for employing capable human resources, building and managing an agent network, re-engineering some branch processes, training staff, and launching a significant marketing campaign. MFIs that have embarked down this path have spent anywhere from a few hundred thousand dollars to more than $1 million to develop the actual system. 6. The MFI has sufficient transaction volumes to allow the upfront costs to be recouped faster. Only in rare cases will MFIs meet all of these conditions. Given the complexity and expense of developing an m-banking system, only the strongest and biggest MFIs should attempt it. As more MFIs experiment with m-banking and as more technology vendors develop appropriate off-the-shelf solutions at lower prices, this may change. 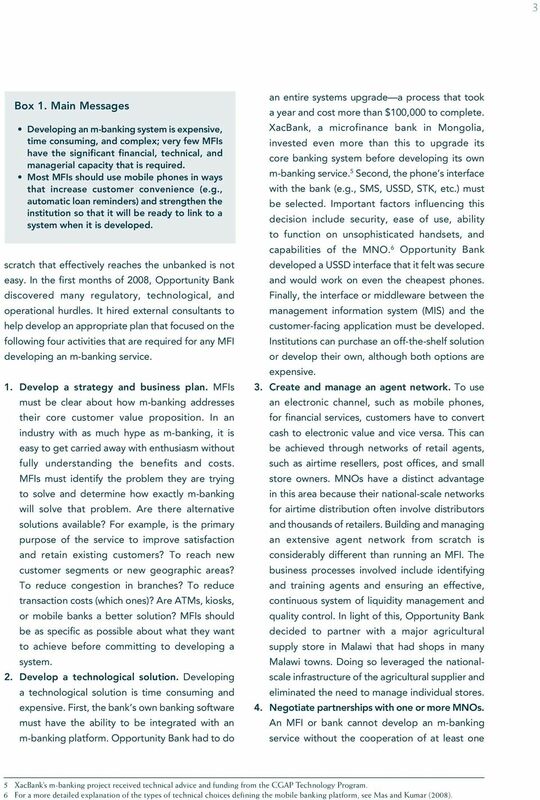 Furthermore, we expect more MNOs to be offering m-banking products that MFIs can leverage. Some MFIs have overcome these obstacles in interesting ways. Tameer Microfinance Bank (120,000 customers, $23.6 million portfolio outstanding, and $17 million in deposits) in Pakistan did meet all of the criteria listed and has launched an m-banking service (called easypaisa) that shows promise of reaching scale. 8 In the first six months after launching, easypaisa processed well over 1 million transactions. The bank started its m-banking process on its own without an existing m-banking infrastructure. However, it did not bring the product to market on its own but rather it worked closely with one of Pakistan s leading MNOs to do so. 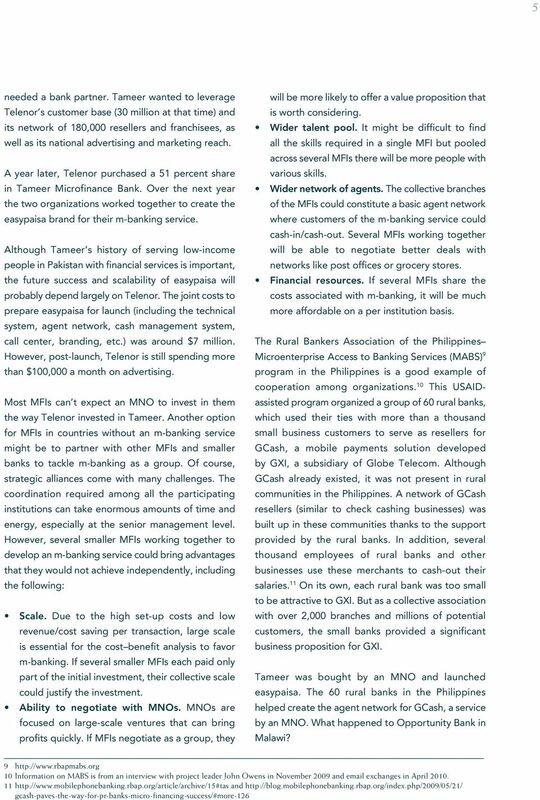 In 2007, Tameer Microfinance Bank started negotiations with Telenor, the second largest MNO in Pakistan. The regulator in Pakistan required an MNO to develop m-banking services in collaboration with a bank. As such, Telenor 7 For more information on regulations specific to branchless banking see Lyman, Pickens, and Porteous (2008). 8 Tameer Microfinance Bank s m-banking project received technical advice and funding from the CGAP Technology Program. Information about easypaisa was obtained from a telephone interview with Abbas Sikaner (group executive director of Tameer Microfinance Bank) in February 2010. 6 6 Opportunity Bank spent most of 2008 upgrading its MIS and developing a business plan. In 2009, it built the technology solution, secured regulatory approvals after many meetings with the Central Bank, and did customer research to form the basis of a marketing plan. It began pilot testing its service (called Banki mmanja or bank in your hand ) with staff and launched the product in May Only time will tell whether Opportunity Bank made the right decision to spend the time and money to develop its own m-banking system. It took more than two years to develop the service. According to Opportunity Bank, if at least 10 percent of existing customers sign up for the service by the end of the first year and each customer does at least two transactions a month, Opportunity Bank will make profits on the service by the middle of the second year. 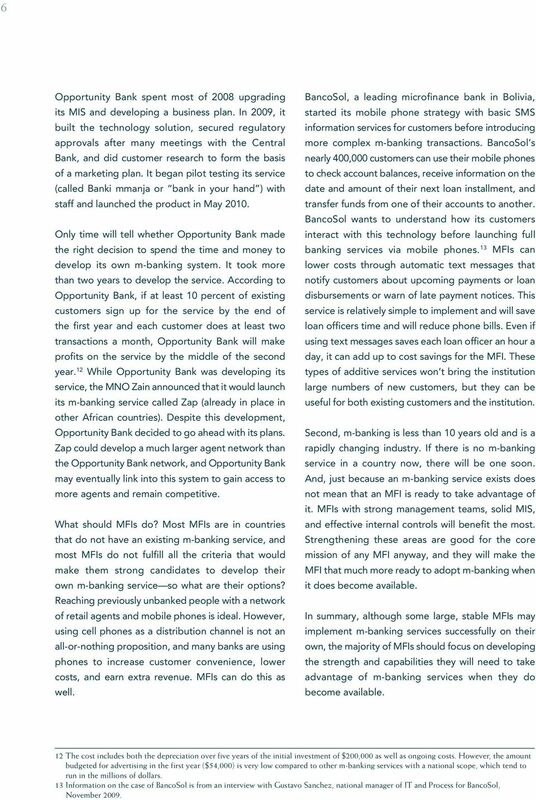 12 While Opportunity Bank was developing its service, the MNO Zain announced that it would launch its m-banking service called Zap (already in place in other African countries). Despite this development, Opportunity Bank decided to go ahead with its plans. Zap could develop a much larger agent network than the Opportunity Bank network, and Opportunity Bank may eventually link into this system to gain access to more agents and remain competitive. What should MFIs do? Most MFIs are in countries that do not have an existing m-banking service, and most MFIs do not fulfill all the criteria that would make them strong candidates to develop their own m-banking service so what are their options? Reaching previously unbanked people with a network of retail agents and mobile phones is ideal. However, using cell phones as a distribution channel is not an all-or-nothing proposition, and many banks are using phones to increase customer convenience, lower costs, and earn extra revenue. MFIs can do this as well. BancoSol, a leading microfinance bank in Bolivia, started its mobile phone strategy with basic SMS information services for customers before introducing more complex m-banking transactions. BancoSol s nearly 400,000 customers can use their mobile phones to check account balances, receive information on the date and amount of their next loan installment, and transfer funds from one of their accounts to another. BancoSol wants to understand how its customers interact with this technology before launching full banking services via mobile phones. 13 MFIs can lower costs through automatic text messages that notify customers about upcoming payments or loan disbursements or warn of late payment notices. This service is relatively simple to implement and will save loan officers time and will reduce phone bills. Even if using text messages saves each loan officer an hour a day, it can add up to cost savings for the MFI. These types of additive services won t bring the institution large numbers of new customers, but they can be useful for both existing customers and the institution. Second, m-banking is less than 10 years old and is a rapidly changing industry. If there is no m-banking service in a country now, there will be one soon. And, just because an m-banking service exists does not mean that an MFI is ready to take advantage of it. MFIs with strong management teams, solid MIS, and effective internal controls will benefit the most. Strengthening these areas are good for the core mission of any MFI anyway, and they will make the MFI that much more ready to adopt m-banking when it does become available. In summary, although some large, stable MFIs may implement m-banking services successfully on their own, the majority of MFIs should focus on developing the strength and capabilities they will need to take advantage of m-banking services when they do become available. 12 The cost includes both the depreciation over five years of the initial investment of $200,000 as well as ongoing costs. However, the amount budgeted for advertising in the first year ($54,000) is very low compared to other m-banking services with a national scope, which tend to run in the millions of dollars. 13 Information on the case of BancoSol is from an interview with Gustavo Sanchez, national manager of IT and Process for BancoSol, November 2009. 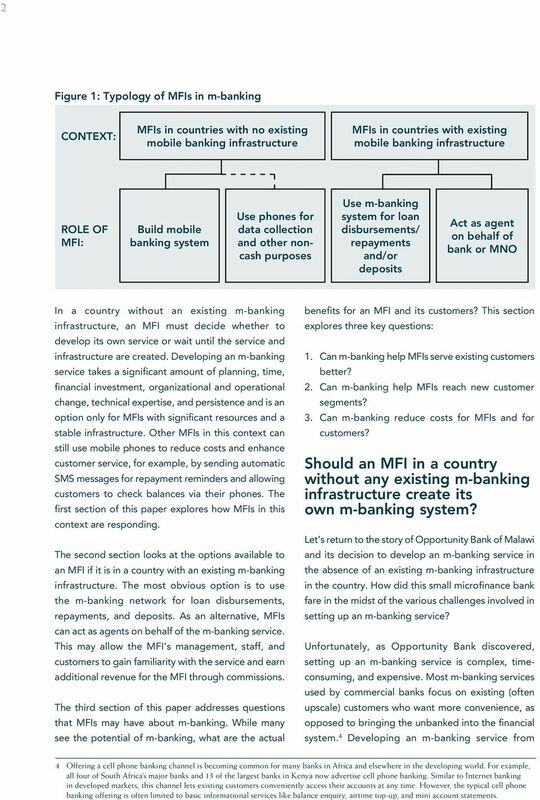 7 7 What Role Can an Mfi Play in a Country with Existing Mobile Banking Infrastructure? Can mobile banking be used to collect loan repayments and deposits? There are several options available to MFIs in a country with an existing m-banking system. The first and most obvious application of m-banking is to facilitate loan repayments and deposits. 14 As we explain in this section, MFIs that have done this report lower risk and costs for themselves and their customers from handling and transporting large amounts of cash. Although everyone interested in m-banking has heard of M-PESA, many don t know that M-PESA actually started as a pilot to facilitate microfinance loan repayments with the MFI Faulu Kenya. 15 Originally, Safaricom (the MNO) wanted to combine its connectivity, brand, and distribution network of airtime resellers with Faulu s low-income customer base to enable customers to receive loan disbursements and make loan repayments using mobile phones. The two organizations ran a pilot for six months in 2005 during which time Faulu customers used the service to repay loans. While the intent of the pilot was loan repayment, customers used the service in all sorts of creative ways that were very interesting to Safaricom. They used it to pay for goods and services between pilot participants and to convert the e-money to airtime that could be sent to relatives in other parts of the country. As a result of this pilot, Safaricom altered its strategy and developed the key marketing message of M-PESA, Send Money Home, and went on to launch the most successful m-payments service in the world. Box 2. Main Messages MFIs can use existing m-banking systems to facilitate both loan repayments and deposits. This does not necessarily increase credit risk, although the impact on group cohesion must be carefully managed. MFIs can also act as agents on behalf of a bank or MNO s m-banking service. This can help both the MFI and its customers to become familiar with the system and bring in additional revenue. What happened at Faulu Kenya? 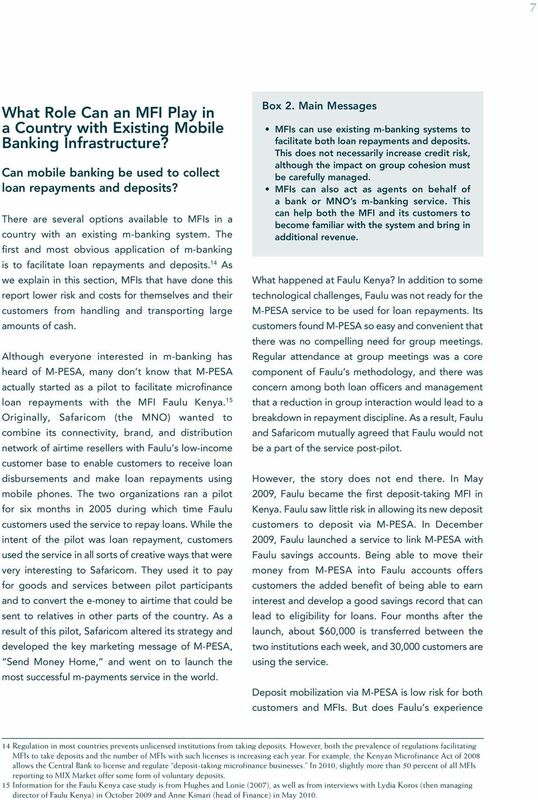 In addition to some technological challenges, Faulu was not ready for the M-PESA service to be used for loan repayments. Its customers found M-PESA so easy and convenient that there was no compelling need for group meetings. Regular attendance at group meetings was a core component of Faulu s methodology, and there was concern among both loan officers and management that a reduction in group interaction would lead to a breakdown in repayment discipline. As a result, Faulu and Safaricom mutually agreed that Faulu would not be a part of the service post-pilot. However, the story does not end there. In May 2009, Faulu became the first deposit-taking MFI in Kenya. Faulu saw little risk in allowing its new deposit customers to deposit via M-PESA. In December 2009, Faulu launched a service to link M-PESA with Faulu savings accounts. Being able to move their money from M-PESA into Faulu accounts offers customers the added benefit of being able to earn interest and develop a good savings record that can lead to eligibility for loans. Four months after the launch, about $60,000 is transferred between the two institutions each week, and 30,000 customers are using the service. Deposit mobilization via M-PESA is low risk for both customers and MFIs. But does Faulu s experience 14 Regulation in most countries prevents unlicensed institutions from taking deposits. However, both the prevalence of regulations facilitating MFIs to take deposits and the number of MFIs with such licenses is increasing each year. For example, the Kenyan Microfinance Act of 2008 allows the Central Bank to license and regulate deposit-taking microfinance businesses. In 2010, slightly more than 50 percent of all MFIs reporting to MIX Market offer some form of voluntary deposits. 15 Information for the Faulu Kenya case study is from Hughes and Lonie (2007), as well as from interviews with Lydia Koros (then managing director of Faulu Kenya) in October 2009 and Anne Kimari (head of Finance) in May 2010. 8 8 mean that loan repayment via M-PESA is too risky? Probably not. In 2005, the service was the first of its kind. The emphasis of the pilot was on the technology itself, and little thought was given beforehand to the impact on group cohesion. Using external technical assistance, 16 Small and Micro Enterprise Programme (SMEP) in Kenya was the first MFI to link into the M-PESA platform for group loan repayments. Following a 2008 pilot with 200 group loan customers, the service was rolled out to all of SMEP s 51,000 customers in 2009, allowing them to make loan repayments and savings contributions. 17 SMEP customers pay through M-PESA before the meetings, and the loan officer verifies at the meetings that the loan payments have been received. Kenya Women s Finance Trust (KWFT) is doing something very similar. 18 With more than 300,000 active borrowers and a loan portfolio of nearly $140 million outstanding, KWFT is probably the largest MFI using M-PESA for loan repayments today. 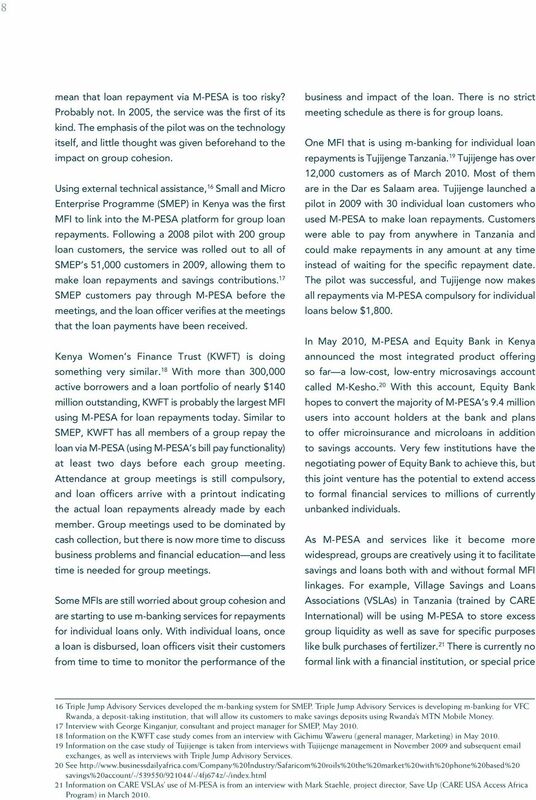 Similar to SMEP, KWFT has all members of a group repay the loan via M-PESA (using M-PESA s bill pay functionality) at least two days before each group meeting. Attendance at group meetings is still compulsory, and loan officers arrive with a printout indicating the actual loan repayments already made by each member. Group meetings used to be dominated by cash collection, but there is now more time to discuss business problems and financial education and less time is needed for group meetings. Some MFIs are still worried about group cohesion and are starting to use m-banking services for repayments for individual loans only. With individual loans, once a loan is disbursed, loan officers visit their customers from time to time to monitor the performance of the business and impact of the loan. There is no strict meeting schedule as there is for group loans. One MFI that is using m-banking for individual loan repayments is Tujijenge Tanzania. 19 Tujijenge has over 12,000 customers as of March Most of them are in the Dar es Salaam area. Tujijenge launched a pilot in 2009 with 30 individual loan customers who used M-PESA to make loan repayments. Customers were able to pay from anywhere in Tanzania and could make repayments in any amount at any time instead of waiting for the specific repayment date. The pilot was successful, and Tujijenge now makes all repayments via M-PESA compulsory for individual loans below $1,800. In May 2010, M-PESA and Equity Bank in Kenya announced the most integrated product offering so far a low-cost, low-entry microsavings account called M-Kesho. 20 With this account, Equity Bank hopes to convert the majority of M-PESA s 9.4 million users into account holders at the bank and plans to offer microinsurance and microloans in addition to savings accounts. Very few institutions have the negotiating power of Equity Bank to achieve this, but this joint venture has the potential to extend access to formal financial services to millions of currently unbanked individuals. As M-PESA and services like it become more widespread, groups are creatively using it to facilitate savings and loans both with and without formal MFI linkages. For example, Village Savings and Loans Associations (VSLAs) in Tanzania (trained by CARE International) will be using M-PESA to store excess group liquidity as well as save for specific purposes like bulk purchases of fertilizer. 21 There is currently no formal link with a financial institution, or special price 16 Triple Jump Advisory Services developed the m-banking system for SMEP. Triple Jump Advisory Services is developing m-banking for VFC Rwanda, a deposit-taking institution, that will allow its customers to make savings deposits using Rwanda s MTN Mobile Money. 17 Interview with George Kinganjur, consultant and project manager for SMEP, May Information on the KWFT case study comes from an interview with Gichimu Waweru (general manager, Marketing) in May Information on the case study of Tujijenge is taken from interviews with Tujijenge management in November 2009 and subsequent exchanges, as well as interviews with Triple Jump Advisory Services. 20 See savings%20account/-/539550/921044/-/4fj674z/-/index.html 21 Information on CARE VSLAs use of M-PESA is from an interview with Mark Staehle, project director, Save Up (CARE USA Access Africa Program) in March 2010. 10 10 new customers, and it trained new and existing staff on cash-in/cash-out procedures. It estimated that each dedicated staff needed to open 100 new WING accounts a month to break even. After six months, it became apparent that the 100 account threshold was not being reached. Through negotiations with WING, VisionFund transfered the costs of the WING Pilots to WING directly, while still housing the WING Pilots in its branches. VisionFund still directly provides the WING Cash X-press points for cash-in/cash-out. Therefore, even serving as an agent for an m-banking service involves costs that MFIs must consider in addition to the extra revenue. 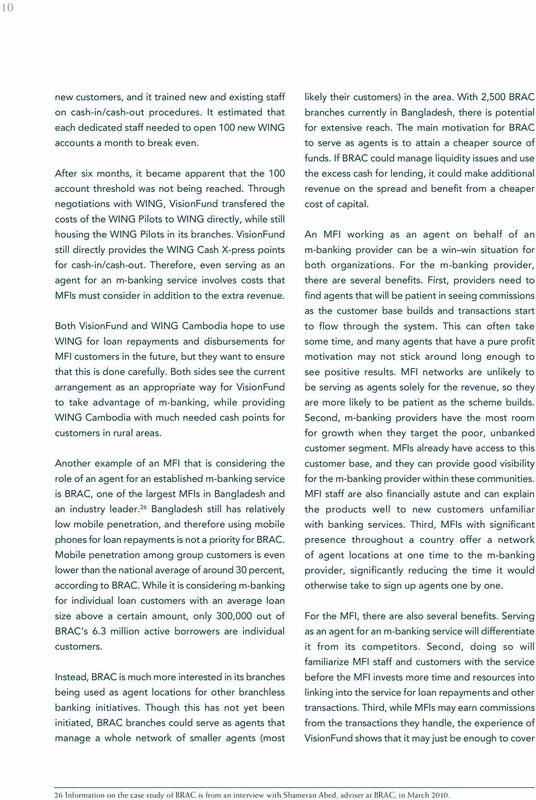 Both VisionFund and WING Cambodia hope to use WING for loan repayments and disbursements for MFI customers in the future, but they want to ensure that this is done carefully. 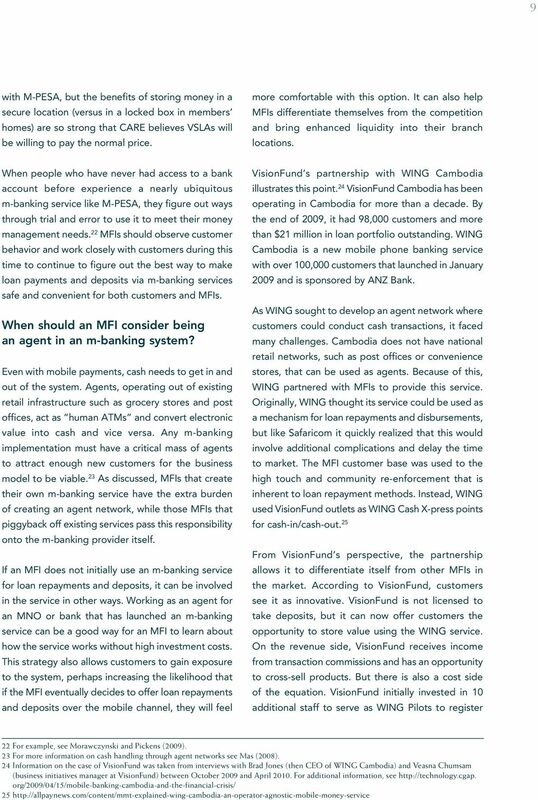 Both sides see the current arrangement as an appropriate way for VisionFund to take advantage of m-banking, while providing WING Cambodia with much needed cash points for customers in rural areas. Another example of an MFI that is considering the role of an agent for an established m-banking service is BRAC, one of the largest MFIs in Bangladesh and an industry leader. 26 Bangladesh still has relatively low mobile penetration, and therefore using mobile phones for loan repayments is not a priority for BRAC. Mobile penetration among group customers is even lower than the national average of around 30 percent, according to BRAC. While it is considering m-banking for individual loan customers with an average loan size above a certain amount, only 300,000 out of BRAC s 6.3 million active borrowers are individual customers. Instead, BRAC is much more interested in its branches being used as agent locations for other branchless banking initiatives. Though this has not yet been initiated, BRAC branches could serve as agents that manage a whole network of smaller agents (most likely their customers) in the area. With 2,500 BRAC branches currently in Bangladesh, there is potential for extensive reach. The main motivation for BRAC to serve as agents is to attain a cheaper source of funds. If BRAC could manage liquidity issues and use the excess cash for lending, it could make additional revenue on the spread and benefit from a cheaper cost of capital. An MFI working as an agent on behalf of an m-banking provider can be a win win situation for both organizations. For the m-banking provider, there are several benefits. First, providers need to find agents that will be patient in seeing commissions as the customer base builds and transactions start to flow through the system. This can often take some time, and many agents that have a pure profit motivation may not stick around long enough to see positive results. MFI networks are unlikely to be serving as agents solely for the revenue, so they are more likely to be patient as the scheme builds. Second, m-banking providers have the most room for growth when they target the poor, unbanked customer segment. MFIs already have access to this customer base, and they can provide good visibility for the m-banking provider within these communities. MFI staff are also financially astute and can explain the products well to new customers unfamiliar with banking services. Third, MFIs with significant presence throughout a country offer a network of agent locations at one time to the m-banking provider, significantly reducing the time it would otherwise take to sign up agents one by one. For the MFI, there are also several benefits. Serving as an agent for an m-banking service will differentiate it from its competitors. Second, doing so will familiarize MFI staff and customers with the service before the MFI invests more time and resources into linking into the service for loan repayments and other transactions. Third, while MFIs may earn commissions from the transactions they handle, the experience of VisionFund shows that it may just be enough to cover 26 Information on the case study of BRAC is from an interview with Shameran Abed, adviser at BRAC, in March 2010. 11 11 their costs. If MFIs can stay ahead of their competitors and learn about a new m-banking service without losing money, it is worth the effort. What Benefits Can Mfis Expect to Gain by Using Mobile Banking? Can m-banking help MFIs serve existing customers better? 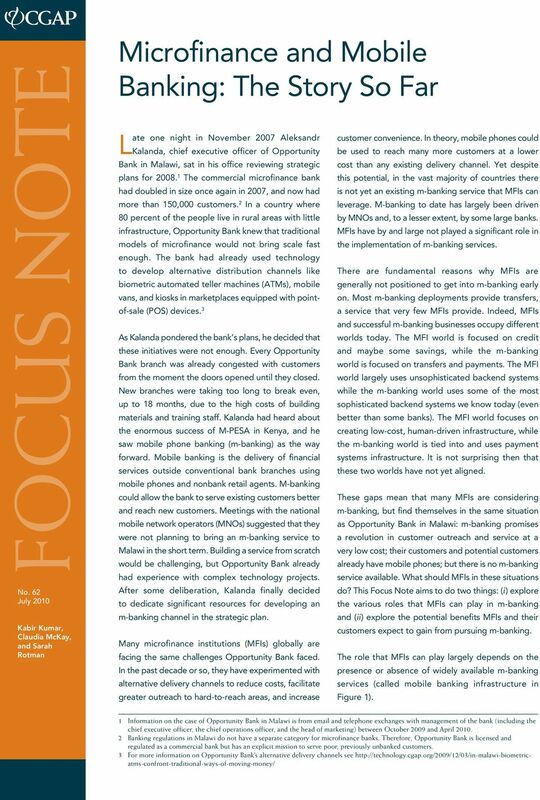 MFIs around the world see m-banking as an opportunity to reach new customer segments and grow faster. Mobile phones can expand the reach of MFIs that struggle with the high costs associated with servicing extremely hard-to-reach rural customers. However, evidence suggests that the first benefit that results from m-banking for MFIs is improved customer service to existing customers. This has been the experience of SMEP in Kenya once it linked into the M-PESA platform for repayment services for its customers. Before M-PESA was used, a SMEP customer had a lengthy repayment process. She would carry her cash to the group gathering location. Meetings would be long as each customer s cash was counted and recorded by the loan officer. This can take a particularly long time in Kenya since fake bills are common, and the treasurer must inspect every note to make sure it is genuine. If she was the group treasurer, she would then have to take all of the group s cash to the bank, wait her turn at the bank, and finally deposit the money. As a small business owner, she would spend a significant amount of time away from her business. In addition, she incurred substantial security risk walking and taking the bus with large amounts of cash. Now with M-PESA, the process is simple and safer. At any time during the repayment period, when the customer has the cash flow to make her repayment (or even a portion of the repayment), she can walk to a nearby M-PESA agent, load money into her account, and send the electronic value to the SMEP account directly. Meetings with the loan officer now involve quick verification of the transaction, which allows the customer to return to her business faster. 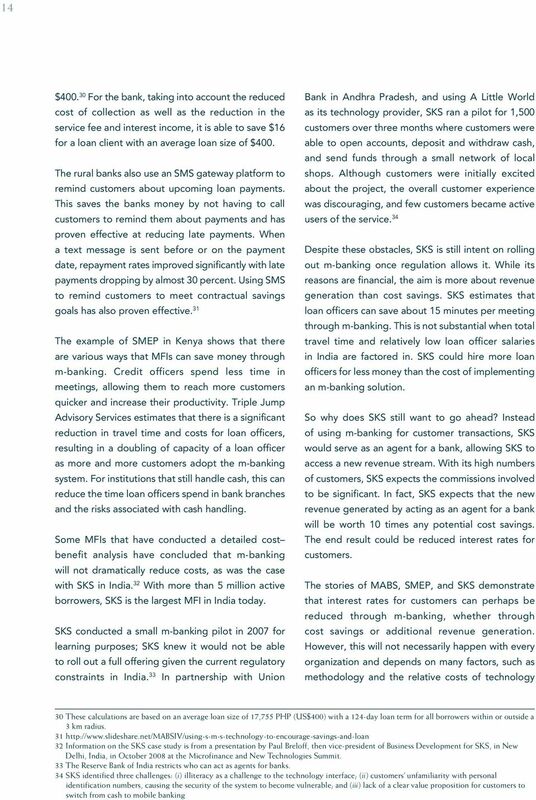 27 While the m-banking platform has not brought new customers to SMEP (at least, not yet), SMEP reports that it has increased customer satisfaction for its existing ones. One indication of the value of the service to existing customers is their willingness to pay a fee in order to repay via M-PESA. M-PESA treats microfinance loan repayments as bill payments. Customers pay $0.25 per transaction, and MFIs pay from zero to $1.25 depending on the value of the transfer. Customer willingness to pay depends very much on the previous cash collection method used. In the case of SMEP, where the cash transport responsibility lies with customers, customers are very willing to pay a small fee to have heightened security and save hours every week. Lydia Koros, former managing director of Faulu Kenya, says, Does the cost deter customers? No. We have educated our customers to look at the total cost of making a transaction including bus fare and the opportunity cost of the time spent traveling and waiting in queues versus running their business. They realize that if they walk one block to deposit quickly at an M-PESA agent, the $0.25 is much cheaper than taking a bus ride to the nearest Faulu branch. In this case, the primary benefit to MFIs is greater customer satisfaction. On the other hand, many MFI loan officers in other countries collect cash at group meetings and travel with the cash to an MFI branch office or a partnering bank branch. These MFIs benefit significantly from m-banking through a reduction in security risk and fraud risk. However, customers who are used to free cash collection at their doorstep may not immediately see the benefit of taking responsibility for their own loan payments through an m-banking service. Even $0.25 to transfer funds to the MFI may seem high. 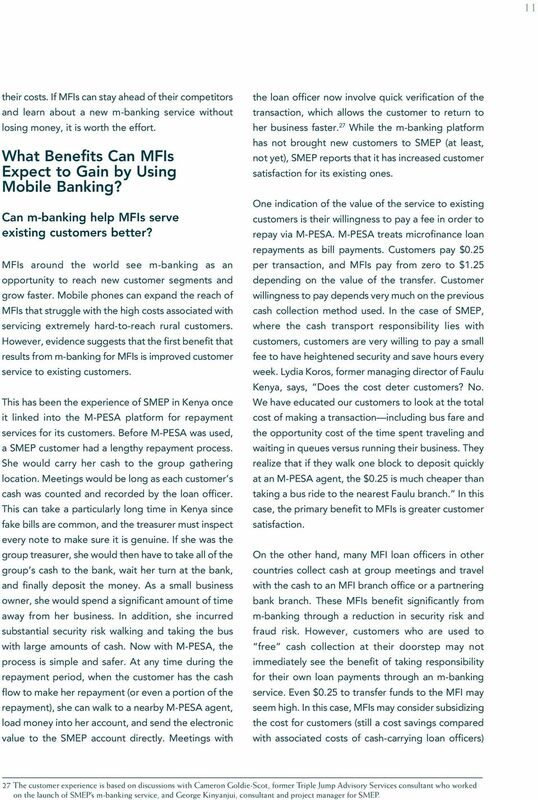 In this case, MFIs may consider subsidizing the cost for customers (still a cost savings compared with associated costs of cash-carrying loan officers) 27 The customer experience is based on discussions with Cameron Goldie-Scot, former Triple Jump Advisory Services consultant who worked on the launch of SMEP s m-banking service, and George Kinyanjui, consultant and project manager for SMEP. 16 No. 62 July 2010 services in different ways. Both MFIs and their customers will benefit from the intersection of m-banking and microfinance, and these benefits will be greatest for MFIs who prepare strategically and consider carefully the timing and method of their involvement. 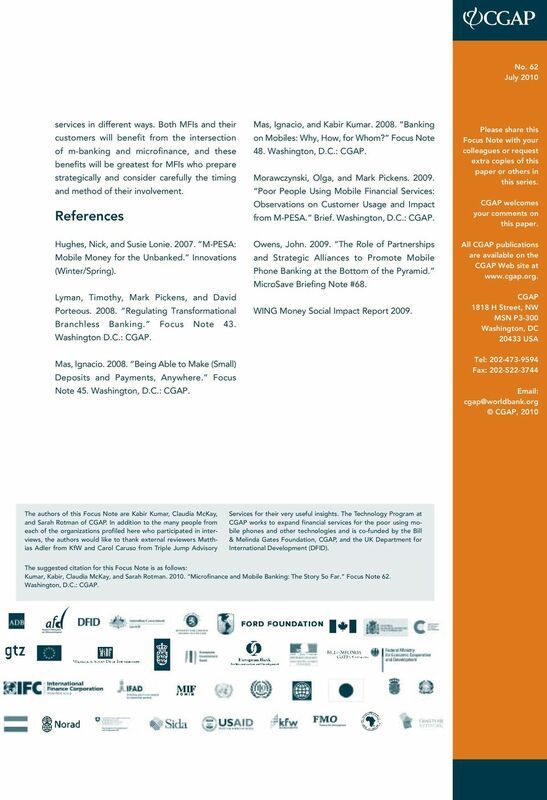 References Hughes, Nick, and Susie Lonie M-PESA: Mobile Money for the Unbanked. Innovations (Winter/Spring). Lyman, Timothy, Mark Pickens, and David Porteous Regulating Transformational Branchless Banking. Focus Note 43. Washington D.C.: CGAP. Mas, Ignacio Being Able to Make (Small) Deposits and Payments, Anywhere. Focus Note 45. Washington, D.C.: CGAP. Mas, Ignacio, and Kabir Kumar Banking on Mobiles: Why, How, for Whom? Focus Note 48. Washington, D.C.: CGAP. Morawczynski, Olga, and Mark Pickens Poor People Using Mobile Financial Services: Observations on Customer Usage and Impact from M-PESA. Brief. Washington, D.C.: CGAP. Owens, John The Role of Partnerships and Strategic Alliances to Promote Mobile Phone Banking at the Bottom of the Pyramid. MicroSave Briefing Note #68. WING Money Social Impact Report Please share this Focus Note with your colleagues or request extra copies of this paper or others in this series. CGAP welcomes your comments on this paper. All CGAP publications are available on the CGAP Web site at CGAP 1818 H Street, NW MSN P3-300 Washington, DC USA Tel: Fax: CGAP, 2010 The authors of this Focus Note are Kabir Kumar, Claudia McKay, and Sarah Rotman of CGAP. In addition to the many people from each of the organizations profiled here who participated in interviews, the authors would like to thank external reviewers Matthias Adler from KfW and Carol Caruso from Triple Jump Advisory Services for their very useful insights. The Technology Program at CGAP works to expand financial services for the poor using mobile phones and other technologies and is co-funded by the Bill & Melinda Gates Foundation, CGAP, and the UK Department for International Development (DFID). The suggested citation for this Focus Note is as follows: Kumar, Kabir, Claudia McKay, and Sarah Rotman Microfinance and Mobile Banking: The Story So Far. Focus Note 62. Washington, D.C.: CGAP. Introduction to the similar solutions and compare with the proposed system. Bridging the rural urban banking divide: what s been done and what needs to be. CGAP Brief August 2007 MFI Capital Structure Decision Making: A Call for Greater Awareness Microfinance institutions (MFIs) today have an increasingly broad range of financing sources at their disposal. Transformation through innovation: Lessons from M-PESA Japhet Aritho Head of M-PESA Product Development and Operations Safaricom Limited Kenya at a Glance 39 million population growing at 2% per annum. Euronet USA, Inc. 17300 Chenal Parkway, Suite 200 Little Rock, AR, 72223 Tel: 1-501-218-7300 Fax: 1-501-218-7302 E-mail us at: mail@euronetworldwide.com Visit our Web site at www.euronetworldwide.com. Do Low-Cost Bundled Banking Services Solutions Cost More in the Long Run? VENTURE CAPITAL 101 I. WHAT IS VENTURE CAPITAL? CASH AND RETAIL PAYMENT SYSTEMS IN DEVELOPING COUNTRIES, OPPORTUNITIES AND CHALLENGES: THE CASE OF MALAWI. Lenia N. Banda and Fraser H.
Introduction to Health Care Accounting. What Is Financial Management? KENYA READY FOR TAKE OFF? FocusNote NO. 38 OCTOBER 2006 USE OF AGENTS IN BRANCHLESS BANKING FOR THE POOR: REWARDS, RISKS, AND REGULATION The authors of this Focus Note are Timothy R. Lyman, Gautam Ivatury, and Stefan Staschen. Mobile Money- What s next?